We’ve always known Wagamama is good with allergies and gluten free, but had never actually tried it out with the kids. eventually. After our very positive Pho experience, we felt they were ready to try out the noodle based food. Now with over 100 restaurants over the UK and now abroad too in Europe and US, Wagamama has become a global brand of accessible asian food based on Japanese cuisine. We went to their flagship store on the Southbank in London, under Embankment Bridge. It’s recently had an expansion and refurbishment so lucky for us they had extra staff milling around to make sure the opening weeks went well. 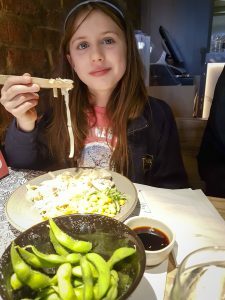 As soon as we told the waitress that the kids had coeliac disease and allergies, they explained that we could choose from both the gluten free menu and the kids menu. They can swop out any noodles for gluten free ones and any sauce for Tamari based sauced (Tamari is a japanese soya sauce which is naturally gluten free unlike the other soya sauce which nearly always contains wheat). They also explained that with coeliac disease and allergies, the manager comes and takes the order and will help cook the food separately alongside the head chef. We were pleasantly surprosed by this level of attention, and have to say felt great. I’d love to see other restaurants adopt this policy. 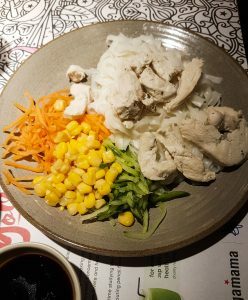 The stir fried chicken was a great portion for a child, and after she picked out the bits she didn’t like, she loved it. The chicken and noodles was very plain, maybe a bit too much so. I guess they are playing it safe for kids. There wasn’t quite enough flavouring to make this a really tasty meal and tamari sauce on it’s own as a flavouring can be quite intense for some kids. I think my eldest probably should have gone for a full portion of ramen in hindsight, which she loves. For dessert they had a choice of ice creams or a fruit lolly with real chunks of fruit inside that looks great and is what the kids chose. So glad we made it to Wagamama, I think to be honest we were more impressed with the service than the food though. 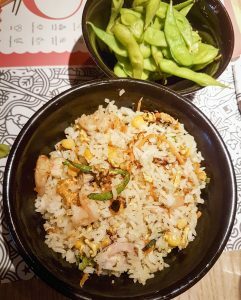 Wagamama is such a big chain now that they are dishing out food for the masses which is no doubt compromising on flavour and uniqueness. I think we’ll probably go to Pho over Wagamama for ramen style noodles. 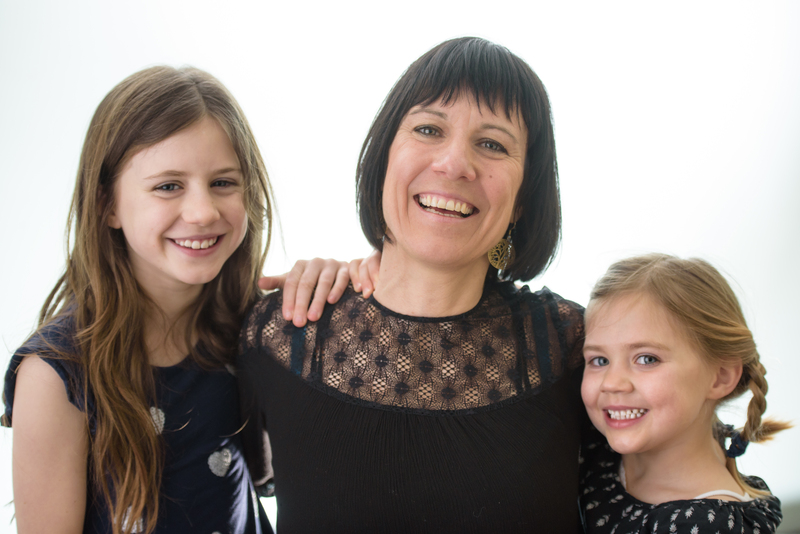 We were incredibly welcomed to the point where we felt quite special, which is such a great thing for anyone with dietary conditions. We were put at ease and felt they took it all very seriously. We will try Wagamama again, and maybe try different things from the menu. 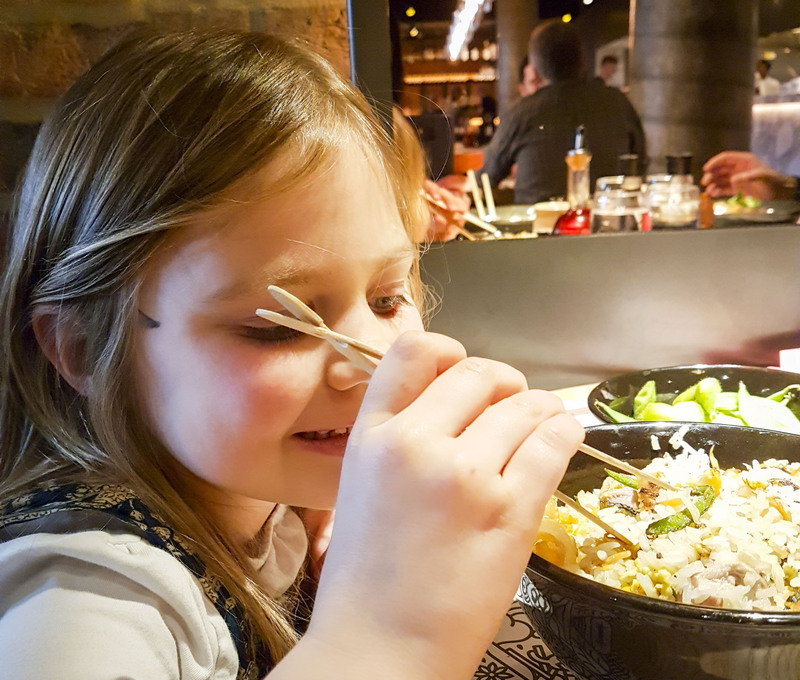 Wagamama is certainly convenient and a fun place to eat and for kids to try out different foods.